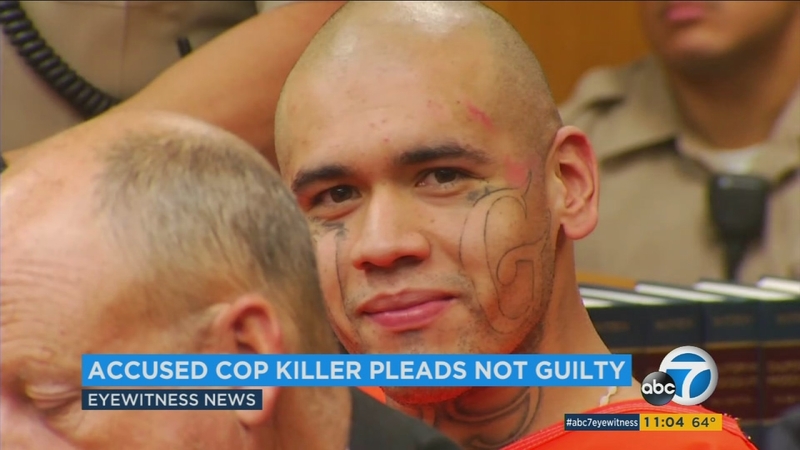 NORWALK, Calif. -- An accused cop killer appeared in court Monday, at times smiling and even chuckling as his own family members sobbed. Michael Mejia, 26, pleaded not guilty to two murders. He is accused of killing his own cousin, 47-year-old Roy Torres, and Whittier police officer Keith Boyer on Feb. 20. Boyer and his partner were responding to a traffic accident and were not aware of the Torres murder earlier that day in City Terrace. As they investigated the accident scene and approached Mejia, he opened fire, killing Boyer and wounding his partner. Mejia, believed to be a gang member, had been released on parole less than two weeks earlier. Prosecutors have not decided yet if they will seek the death penalty.